Junior & Senior Prizegiving took place this week. Neasa Forde was Senior Student of the Year and Grainne Rice, Junior Student of Year. A beautiful graduation ceremony for 6th Years was held on Tuesday, 20th May in Balbriggan Parish Church, followed by refreshments in the school. Transition Year Graduation and Prizegiving takes place on Monday, 20th May. Summer Exams for 1st, 2nd, 4th and 5th Year are on-going. Best wishes to our Junior and Leaving Certificate students taking their examinations in June. Neasa Forde, 6B, Senior Student of the Year. Congratulations to Orla Carron (left), 5B, for winning a silver medal as part of the Irish Team at the European Union Science Olympiad in Cyprus last week and to Sorcha Forde (right) for taking 1st prize in the all-Ireland Schools Chemistry Essay Competition sponsored by the Institute of Chemistry of Ireland together with The Royal Society of Chemistry, ROI Section, and The Society for Chemical Industry, Ireland Section. A wonderful Ceol Loreto Gig took place on Thursday, 15th May. Basketball and Volleyball Blitzs’ took place this week. Congratulations to our new Head Girls: Evelyn Kimmage, Orlagh Murphy and Lorraine Foy. Congratulations to all other student leadership appointments. Preparations for Prizegivings, 6th Year Graduation Mass and Transition Year evening are on-going. The school credit union had another successful year thanks to all our regular savers. 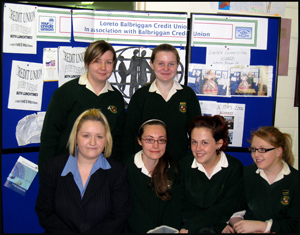 A big thank you to our hard working management team pictured above along with BALBRIGGAN CREDIT UNION student officer Ms. Ciara Brannegan - Claire Nugent, Sarah Gordon, Annabelle Russell, Daenna Walsh and Monica Monaghan. Absent for the photo was Jane Bermingham. Congratulations to our U 14 soccer heroes (above) and champions of Leinster for making it through to the All-Ireland final of the Umbro Minor Girls Cup. Unfortunately they lost to the Munster champions, St. Flannan's College, Ennis, in a hard fought match in Buckley Park, Kilkenny. Well done girls on your great achievement. Alison Fay, 1E, is presented with her certificate and prize for her highly commended entry in the SEI photocompetition by the environmentalist and broadcaster Eanna Ni Lamhna, on May 8th in The Helix. Well done to both teams that made it through to the National Finals of the 'Power of One' competition last night, in Croke Park, and particular congratulations to team Save Our Planet, who were the overall winners of the Competition. The Transition Year musical “Fiddler on the Roof” has been a great success and completes its run of performance on Thursday, 1 st May. Well done to the various sports teams on their performances this week. Congratulations to the U-14 soccer team who defeated Buncrana in the All-Ireland semi-final. Well done to the Tennis team on their victory against Mount Sackville. R.S.E. talks for the First Years take place on Wednesday 23rd. Rehearsal for the Transition Year Musical “Fiddler on the Roof” are currently taking place. The show takes place from Monday 28th to Thursday 1st May. Interviews for Senior student leadership positions took place this week. Well done to Niamh O’Connor Barry on her second place at Loreto Senior Public Speaking and to Sarah Ferguson in the Junior Public Speaking. Well done to the U.16 and U.13 soccer teams on their performances this week. Best wishes to the U.14 in the All Ireland semi-final, in Oriel Park on Tuesday, 22nd April. Orals and practicals finish this week. Rehearsals for “Fiddler on the Roof”, the T.Y. musical are on-going. The show will be performed during the week beginning 28th April. The Parents Association fund-raiser Thai Cookery demonstration was a successful and entertaining evening on Thursday, 17th April. Meeting for Senior Cycle/Transition Year took place on Monday, 14th April. Students are having separate information sessions in the final two weeks in April. The Young Social Innovators Group are presenting their project to the school during the week. It is entitled “To Bebo or not to Bebo”. Relationships and Sexuality talks for Fifth Years took place on Wednesday, 16th April. Inter schools tennis match are beginning next week. Congratulations to the YSI team whose project 'To Bebo or Not to Bebo' has qualified for the annual YSI Showcase in the RDS in May. And a special well done to the group as they were also invited back to perform their Speakout performance at the Showcase. Well done and good luck to all involved. Continuing best wishes to our Third and Sixth Year students taking orals and practicals. Transition Year had trips to Aras an Uachtarain and Mountjoy Prison in the past week. A 3rd Year Science group participated in a Science Quiz. All Transition Years visited Monaghan as part of a Patrick Kavanagh trip. Tickets are on sale for the Parents Association Fund Raising Thai Cookery Night on April 17th at 8 p.m. Tickets cost €15 for adults and €10 for students. Applications are invited for a Parenting Course. Details have been forwarded to students. Congratulations to the Second Year Hockey Team who won the Meath League by defeating Wilson’s Hospital 5 – 1 in the final. Congratulations to the two groups of TY students who have reached the National Final of the “Power of One” competition in Croke Park. The first group are Eadaoinn Copeland, Maire Costello, Rebecca Dolan, Orna Donnelly, Sorcha Forde and Sarah McNally and the second group are Cathy Berger, Shauna Callaghan, Kerry Guinan, Aine O’Toole, Katie Osbourne and Nicole Plunkett. All First Years groups were on History trips to Newgrange and Monasterboice this week. Transition Years received an excellent Road Safety talk from the Gardai. Commiserations to the Transition Year Hockey Team who lost their final and the U.18 team who lost their Leinster soccer semi-final. T.Y. Parent/Teacher meeting took place on Thursday, 3rd April. Parents Association met on 2nd April to plan for the Thai Cookery demonstration on the 17th April. Best wishes to all our Leaving and Junior Certificate students who are involved with orals and practicals in the next two weeks. Congratulations to the school’s Under 14 soccer team who defeated Eureka, Kells in the Leinster Final. Well done to Niamh O’Connor Barry who was highly placed in the Soroptimist Public Speaking Competition. Choir examinations went ahead successfully this week. 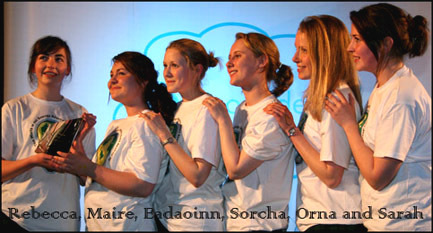 An array of events took place for Seachtain na Gaelige. The Parents Association have arranged a Thai Cookery Night for the 17th April. Tickets on sale soon. Congratulations to Kerry Guinan, Cathy Berger and Aine O’Toole who have reached the finals of the European Parliament Competition to Strasbourg. Best wishes to Niamh O’Connor Barry on her appearance in the final of the Soroptimists Competition in Cork this weekend. Congratulations to the Senior Choir on their excellent performance and commendation in the Feis Ceoil. Transition Year Chemistry trip to U.C.D. occurred during the week. A staff meeting focusing on Learning and Assessment took place this week. Consultation on the school’s Homework Policy continues. Well done to the soccer and Gaelic teams on their performance this week. The first year basketball team were narrowly beaten in their semi final. Transition Years had a one day retreat this week. Well done to the four T.Y. project groups who have entered the Power of One national competition. One of the teams created a web page as part of their project. Well done to the Basketball and soccer team on their performances this week. Third Years took their DATs test on Monday, 18th February. Supervalu have donated a Defibulator to the school. A number of staff have had training in the use of the Defibulator this week. The Transition Years involved in the Young Social Innovators were in Tuesday’s “Y.S.I. Speak Out”. Congratulations to Riona Smith (T.Y.) on her major role in the newly released film 32A. The film was recently on view at the Berlin Film Festival. Ashes were distributed on Ash Wednesday to all students. Particular congratulations to Niamh O’Connor Barry on reaching the finals of the Soroptimists Public Speaking Competition. These will be held in Cork in early March. Well done to the hockey teams on their performance and victories in Dundalk this week. Mock Examinations conclude on Friday, 8th. Transition Year work experience placement concludes on Friday, 8th. 5th Year Physics students visited the RDS for the annual Tyndall lecture on Monday, 4th February. An enjoyable mid-term break to all connected with Loreto Secondary School, Balbriggan. Mock Examinations for Junior & Leaving Certificates continue this week. Work Experience for Transition Years continues. Each student is visited by a teacher at their work experience placement. Fifth Year Music students attended their set-works concert in Waterford this week. Well done to the U.14 soccer team on their recent victories. Hard luck to the two second year hockey teams who lost quarter finals in penalty shoot-outs. Best wishes to Niamh O’Connor Barry in the second round of the Soroptimists Public Speaking Competition in Sligo this weekend. Well done to the French Quiz team of Orla Carron, Marie Farrell, Ruth O’Toole and Evelyn Kimmage on coming fourth in the Dublin Competition during the week. Transition Years are on work experience placement over the next three weeks. This is Mary Ward week, the foundress of the Loreto Order. There are a multitude of commemorative events in all Loreto Schools this week including Loreto Balbriggan. Well done to the U-14 soccer team who qualified for the Leinster Final by beating Alexandra College 4- 1. Congratulations to Niamh O’Connor Barry who qualified for the next round of the Soropitimists Public Speaking Competition. First Years are having a one day dance class this week. Best wishes to Junior & Leaving Certificate students in their Mock Examinations. Well done to the 2nd Year Hockey Team who defeated Drogheda Grammer 4 -1. Examination Fees for both the Junior Certificate and the Leaving Certificate are now due. The Mock Examination Timetable is also available to download. Mock Interviews for Fifth Years continue this week. The 2nd Year Parent Teacher meeting took place on Monday, 14th January. First Year Retreats took place on Monday and Tuesday, 14th & 15th January respectively. Well done to the Transition Year Gaisce team who organized the Junior Talent Show. The acts were of a great standard. In third place was the Mulan Sketch, the second place was awarded to Aoife Ryan and Ciara McGuinness. Congratulations to the winners, Jessica Wylie and Claire Colgan. Well done to the football and hockey teams on their performances this week, especially the 2nd Year Hockey team who defeated Santa Sabina 7 – 0. Best wishes to the students involved in the regional Soroptimists Public Speaking Competition. They are: Evelyn Kimmage, Marie Farrell, Niamh O’Connor Barry and Sorcha Forde. A Transition Year group visited Mountjoy Jail on Thursday, 17th January. Happy New Year to all associated with Loreto Secondary School, Balbriggan. An extra curricular Music Trip to London occurs this weekend. The group will attend two West End Musicals. The Transition Year Physics classes will attend the Young Scientist Exhibition in the R.D.S. on Friday, 11th January. First Years and their Fifth Year Twins had a Fun Quiz on Monday, 17th December. The Christmas Carol Service will take place in the parish church on Thursday, 20th Dec at 12 p.m. Advent preparations continue with the singing of O Antiphon pieces on the school intercom. There was exposition of the Blessed Sacrament in the Religion Room on Friday, 14th December. The T.Y. Music group had a two-day music workshop with Song School. Well done to the various hockey teams on their performances this week. The Christmas Newsletter was forwarded to students on Monday, 17th December. Term ends with our traditional Christmas Concert on Friday, 21st. School re-opens for all on January 7th. A happy Christmas and New Year to all connected with Loreto Secondary School, Balbriggan. Congratulations to the various sporting successes this week in hockey and football. A meeting for parents and students going on the London Music Trip took place on Thursday, 6th December. The second year English debating team lost narrowly to Loreto Swords in their English debate. A group of Transition Year students are involved in a Gael Linn course all week. 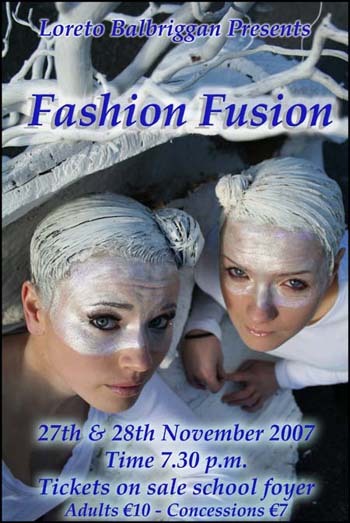 The Transition Year Fashion & Fusion Show was a wonderful success. Both nights were packed and the audience enjoyed a combination of stylish clothes and stunning art work. Particular congratulations to our teachers, Ms. Aisling Lennon and Ms. Michelle Briscoe in addition to the Fashion Show Group. On Thursday, 29th November, a Taize Evening of Remembrance was organized by Ms. McFadden and Ms. Kenna. The theme of the evening was “Swallow Flight”. A mood of reverence and serenity was created by a combination of music, poetry and reflection. Hard luck to the Second year English debating team who lost to Loreto, Navan. Well done to soccer, Gaelic, basketball and hockey teams on their victories this week. A Transition Year Group visited Mountjoy. Congratulations to the Senior Choir who won the Eugene Mooney Memorial Trophy at the Drogheda Choral Festival. Tickets for the T.Y. Fashion Show are presently on sale. The school staff participated in a “Cool School” Anti Bullying seminar on Tuesday, 20th November. The Parents Association met on Wednesday, 21st November. Well done to the Irish Debating team who progressed to the next round of the Debating Competition. A number of North Dublin and Leinster schools debated in Balbriggan on Monday, 20th November. Congratulations to the Junior Debating team who won their debate with Pormarnock Community College. Sarah Ferguson was nominated as best speaker. Well done to the many teams involved in Basketball, Hockey and Football. The Concern Fast in the school took place on Thursday, 22nd November. The Sixth Year Parent/Teacher meeting took place on Thursday, 22nd November. The morning was devoted to School Development Planning. The Science Department of the school organized a number of events to highlight national science week. It included a trip to the Dundalk Institute of Technology, a series of demonstrations in the school’s laboratories and participation in a science quiz. 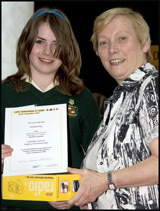 Well done to 5th Year student, Orla Carron, on winning second prize in the national Chemistry awards. There were a number of hockey matches this week. A Transition Year group are involved in the pilot project for the “Power of One” campaign. Well done to Kate O’Keefe, Doireann Casey and Roisin Victory on winning an Entrance Exhibition Award to Trinity College, based on their excellent Leaving Certificate results. The U-16 soccer team lost narrowly to Clondalkin. Preparations for the Transition Year Fashion Show are well advanced. The set promises to be an excellent feature. The Show is scheduled for November 27th & 28th. The Transition Year Parent Teacher meeting took place on Monday evening, 6th November. Four students attended the Loreto in-service for the Student Council. A number of hockey matches, home and away, took place this week. An evening for First Year Parents was held in the school on Monday, 22nd October. Issues addressed were Relations and Sexuality Education; practicalities of First Year and “Teenage Girls”. “Sticks and Stones” anti-bullying seminar was provided for all First Years this week. Second Years went to Armagh for their annual retreat. The Sixth Years’ retreat, also this week, was an optional week of Guided Prayer. Best wishes to the two school trips over mid-term: Business Trip to Barcelona and History Trip to Prague/Krakow. All Third Years took their Geography field trip in the week beginning the 25th October. Transition Year Art students took a Photography Course in the school with Mr. Tim Durham. Well done to the hockey and soccer teams this week on their excellent performances. A wonderful Ceol Loreto Gig showcasing the excellent musical talent in the school was held on Thursday, 25th October. Well done to the hockey team who defeated Newbridge College and Loreto Foxrock this week. Congratulations to Lorna Sweetman (6th Year) on winning Ms. Teen Fingal. A variety of Geography Field Trips are on this week. Fifth Year Retreats are on this week. Well done to the Gaelic U.16 team who had a victory over Raheny. A major fund raising/social awareness campaign for Loreto, Rumbek in Southern Sudan is on next week. It’s a particular project for our Third Years. Student Council elections were completed this week. The Under 14 Soccer team had a 5 – 1 victory over Birr. Congratulations to Ms. Mairead O’Connor and her team of Environmentalists. The school won the Cleaner School Award. Well done, also, to Ms. Caitriona O’Reilly and Ms. Noelle O’Donoghue-McCaul who were awarded the Gaisce PAL President’s Awards by President Mary McAleese. Both teachers have organized the Gaisce President’s Award most successfully for a number of years. The Transition Year musical auditions are almost complete. Students are eagerly awaiting news of the various parts. Congratulations to the U-18’s Gaelic team on their victory over Loreto Swords. The U-18’s soccer team were defeated by Eureka, Kells. Well done also to the the Hockey teams – one team defeated Mount Anville, the other lost narrowly to Sutton Park. Mairead Maeve from Fingal County Council Library gave an excellent talk to Fourth & Fifth Years on the local Library service. Fourth Years had their Relationship and Sexuality Talks (RSE) this week. The Parents Association (A.G.M.) was well attended. The Guest Speaker was Detective Martin Hogan who gave a fascinating account of how various websites (i.e. Bebo) can be abused. Detective Hogan answered many questions afterwards. The T. Y. group on their Science Trip to Belgium are having a most worthwhile experience. The teachers accompanying them are very proud of the way they are representing the school. Congratulations to teachers everywhere on World Teacher Day on Friday, 5th October. There is a Staff Development Day on Friday, 5th October. There will be no classes. Registration for First Year students 2008 took place on Wednesday, 26th September. Best wishes to the T.Y. group on the Science Trip to Belgium next week. Well done to the U.18 Gaelic football team who had a big victory against Fingal Community College. Irish drama workshop on Thursday and Friday this week. The school had its Information Evenings for First Years (September 2008) on Tuesday and Wednesday, 18th and 19th September. The annual Art Exhibition is on Thursday night, 20th September at 7.30 p.m.
Auditions for the Transition Year School musical “Fiddler on the Roof” begin on Thursday, 20th September. Senior students attended the Higher Options Conference on Wednesday, 19th September. The U.18 Soccer team defeated Ballymun Comprehensive on Tuesday, 5 – 0. The U.16 Gaelic team have their first match of the new season on Friday, 21st September. Congratulations to all our Junior Certificate students on their excellent examination marks. Particular congratulations to the students who had straight A’s in their Junior Certificate. The Transition Years received their results while on an outdoor activities week in Mayo. The school mass on September 11th continued the theme of our 150th anniversary mass by focusing on justice issues. Welcome back to all our students and especially to our new 1 st Years. First Years received a three morning Orientation Programme. A big welcome also to the new teachers who join a very committed and hard working staff. A schedule of Parent/Teacher meetings and Staff Meetings will be posted on the website in the near future. This week there is a Study Skills programme for 3 rd & 6 th Years. Well done to Grace Dowling (4 th Year) who won the U.16 World Fleadh Competition for the accordion at the World Fleadh in August.